I have drafted something for what I believe Momentum should be. There has been a lot of talk in the media – exaggerating any differences. Part of the problem is that there has no clear statement of what Momentum stands for. At last a discussion is starting in regional meetings before a National Committee meeting next week – discussion will undoubtedly continue. I hope some statement like this may come out of these debates. I hope also that we get an agreement to have a membership, proper branch structures and a democratic Momentum conference within 3 months. I welcome others views if you agree with it add our name in the form below. Momentum is a social movement committed to: winning Labour for working people; winning working people for Labour; the return of a Labour government which rules in the interests of working people. In pursuit of these aims we promote political discussion and build campaigning alliances which bring together CLPs, trade unions, local community groups and other social movements. 1. Momentum champions the ideas of working-class struggle and working-class political representation, shaping different areas of its work around them. It seeks to actively back working-class, anti-austerity, liberation, etc, struggles and mobilise its supporters to help them – and to win the support of the Labour Party at local and national level for these struggles. This entry was posted in Labour on January 29, 2016 by Pete Radcliff. Assad’s allies – what are they after? This is the second part of an article on the possible outcomes of the peace negotiations on Syria planned to start in January. The first part can be found at this link and argues that none of the forces that will be involved in the peace talks will press for democracy and an end to the religious sectarianism on both sides. This part looks at the forces behind Assad and how they will continue in a Syria that is either divided through partition or remains at war. After the weekends events (Jan 1st-3rd) in Saudi Arabia, the peace talks look increasingly unlikely to take place never mind yield any results. But Syria is already effectively partitioned – so much of the speculation in this posting is equally relevant if the peace talks break down. What will happen to the remains of the Syrian government dominated areas? Assad’s military resources – the Syrian Arab Army was reported to have been between 220-280,000 strong at the outbreak of the civil war. 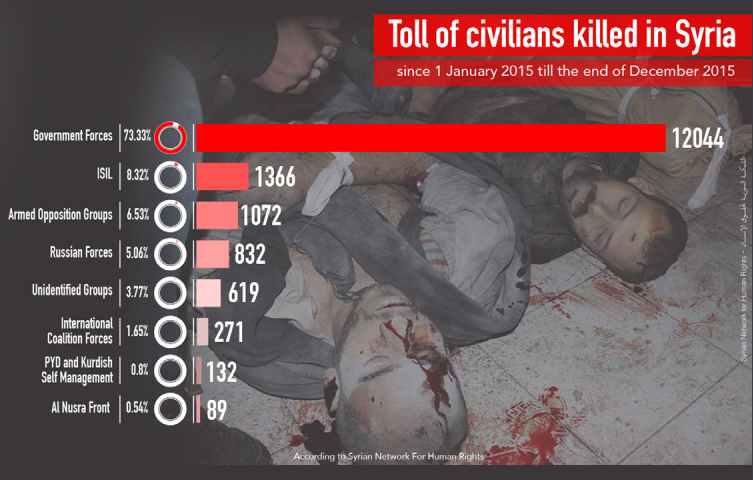 The Syrian Army, along with the other military forces with whom they have been allied, have been responsible for the vast majority of the over 250,000 civilian deaths. On their side they are thought to have lost over 50,000 troops. However huge numbers have also defected or deserted. Something like 40-50,000 have defected to the Free Syrian Army, primarily Sunni Muslims refusing to take part in attacks on civilian Sunni communities. The current strength of the army was estimated to have halved by April 2015 to about 110,000. By July of that year Assad was acknowledging for the first time that his forces could no longer retake all of Syria. This admission led to increased military support from both Iran and Russia. In an attempt to stiffen the armies resolve, Iranian and Hezbollah forces have increasingly carried out operations alongside them and are often put in charge of them. But even now with Russia air support, the regimes overall military successes have been minimal. This entry was posted in Iran, Saudi Arabia, Syria, war on January 3, 2016 by Pete Radcliff.